TAKEN FROM "Trésor d'Histoires sur le Sacré-Coeur"
EVERYONE in the area knew Jean-Marie Duclos the lumberjack. An old soldier, a sapper, he had taken part in every campaign during the Second Empire: Mexico, Crimea, Italy, the Franco-Prussian War of 1870. Finally he had returned to his native mountains with decorations on his chest and a Prussian bullet in his right thigh. Jean-Marie had taken up his ax again at once, but he had never married. When anyone asked him why he had not, he would mumble between his teeth, "I wouldn't want to see any woman in such poverty!" He was not a bad fellow, and he was certainly no enemy of priests. True, he didn't go to Mass on Sunday, having abandoned that habit on the battlefield, but he had a well-founded respect for priests. No one was going to make him believe that the priests had paid the Germans to come in and shed French blood and steal Alsace. He had seen too many good priests risking their lives to help soldiers die, or not die at all. It was something you just never forget. That very memory had been haunting him like a reprimand for the past two days. But why? First of all, the previous Monday, after he had just finished felling an old oak tree, the three little Brothers from the Catholic school had come walking by the edge of the forest. Seeing the sweat streaming from his brow and his old hand trembling a little from fatigue, one of the Brothers, the oldest one, had said to him, "Here, Jean-Marie, let me have your ax," and picked it up without waiting for a reply. The second one picked up his hatchet and the third his saw, and in no time at all they had trimmed all the branches off that big oak. Oh, the strapping fellows had worked heartily and struck true! Surely they were the sons of lumberjacks! Then, that very evening the parish priest had come to his cabin to call on him with a Capuchin Father. That Capuchin, a magnificent man with a sapper officer's beard, had asked him straight on, holding out his hand like a friend, "So, Jean-Marie, will you be coming to the mission this evening?" Instead of answering, he looked for a moment at the gray robe, the bare feet, the manly face, the bright, clear eyes, and asked in his turn, "You were a soldier, right?" "Yes, my friend, I was with the Western Volunteers. I was at Patay and Le Mans." "I was at Patay and Le Mans, too. What time is the mission?" "Eight o'clock every evening, all week long." "What would you think about a son who abandoned and denied his father? A servant who betrayed his master's interests? A soldier who deserted the battlefield and passed over to the enemy? "Jesus is here in the Tabernacle, hidden but alive. He is our God and consequently the Father of us all, our sovereign Master and King. We owe Him love, obedience and fidelity. We must fight for Him against Hell, and against ourselves and our vices. What would you say about someone who falls back in such a battle?" "That man's a coward!" a voice replied, hammering out the syllables with savage energy. It was Jean-Marie Duclos the lumberjack. With pale face and trembling lips he stood up, his hand stretched out towards the altar in an almost tragic gesture, and continued, "Yes, that man's a coward. And that coward is me. But all of that is finished!" You can imagine the rest. Ten minutes later he followed the missionary into the sacristy -----grace had done its work. Now, the next time New Year's came around, Jean-Marie the lumberjack went to pay his respects to his parish priest and wish him a Happy New Year. Actually, he had been coming often to the rectory ever since the unforgettable mission that had turned him into the most faithful man in the parish, the one with the deepest conviction. He even came every Sunday after High Mass to pick up "La Croix" (a religious newspaper) that he brought to his cabin. He read it from one end to the other, starting with the Sunday Gospel and turning to the news from Morocco. It was certainly a better way to pass the time than going to the cafe. So then, as we were saying, on New Year's Day he came to pay his respects to his pastor and to the priest's sister Mariette. "It's very good of you to come, Jean-Marie, even though the weather's not very good up on the Wolf Trail, is it?" "No, by thunder, it's not, Father! There's a North wind blowing . . ."
"Mariette, please bring us a bottle of rum." With this request the lumberjack gave a start: "Rum? Oh no, Father, not for me! I promised the Lord I would never drink again. I did too much drinking in the past." "Good for you! Now, tell me what you'd like. A cup of coffee or some tea?" "Not really, Father. But there is something (as he said this, Jean-Marie started tugging at his ear), there is something . .. but you'll probably think it's sort of . . ."
"No, not at all! What is it?" "Well, I would like it if you gave me a beautiful picture." The priest was certainly not expecting such a request, and he could not help but laugh. "I knew you'd think it was childish. Even so, Father, a picture of the Lord or Our Lady, His Mother, would be a lot better than wood shavings for marking the pages of the Mass in my missal! Besides, Jesus says that we have to be like little children." The good shepherd was no longer laughing. Admiring the man's faith -----simple and naive, but strong and active, too-----he was deeply moved. The priest stood, went to his breviary, took out some beautiful pictures and laid them on the table in front of the lumberjack, inviting him to choose one of them. 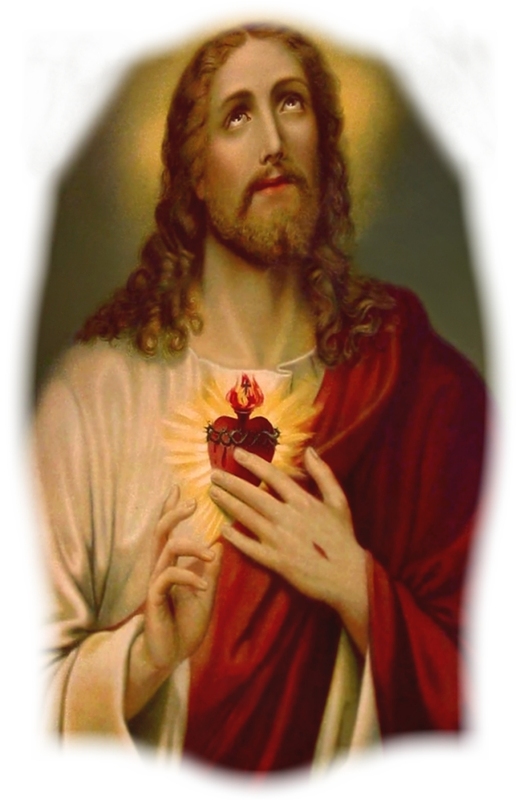 The man took a magnificent Sacred Heart of Jesus. When he got home, the old soldier lit his candle, put on his thick glasses and read all that was printed on his picture. 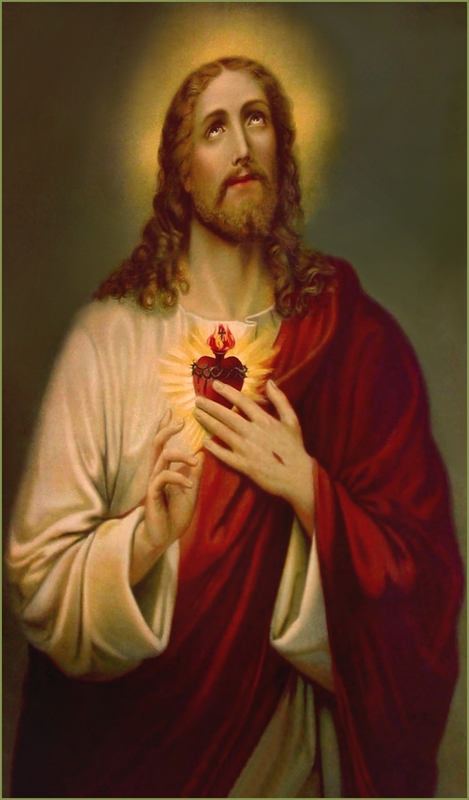 These words in particular impressed him: "Promise of the Sacred Heart of Jesus to Blessed Margaret Mary: I promise you, in the excessive mercy of My Heart, that My all-powerful love will grant to all those who go to Communion on the First Fridays, for nine consecutive months, the grace of final repentance. They shall not die in My disfavor, nor without receiving the Sacraments; My Divine Heart shall be their secure refuge at that last hour." He thought about it all night long. The next day, Sunday, he had a little conversation with the priest on the subject, the practical conclusion being that as of the next Friday, which was the First Friday of January, Jean-Marie would receive Communion every First Friday of the month, no matter what. To do otherwise would be imprudent: there had been too many escapades in his life! And have no fear, he did not forget! Besides, his heart was so content that he even began to look younger, and his hand had never been so steady with the ax. February, March, April, May, June, July, August went by like a dream. It was now the day before the ninth Communion, and that morning he said to himself as he got up, "Tomorrow, Jean-Marie, victory is yours. Oh, what a great day!" All day long he chopped and cut and sawed so energetically and so well that by evening time he was chopping down his sixth oak, a colossal tree that would have given more than one young man quite a battle. The iron of his stout ax bit deep into the thick roots; one by one they gave way, and already the enormous head was beginning to tremble and sway. Four more blows and the mountain giant would fall. Before dealing them, since the tree was close to the road, the old man stopped and looked to see if anyone would be passing by. No one was coming, so there was no danger. Again, the heavy ax rose and fell, and suddenly the mighty oak fell to the ground with a tremendous crash. But unfortunately, the terrific sound of its fall was answered by a horrible cry of pain. Stepping back rapidly, the old lumberjack had slipped: both his legs were pinned to the ground, crushed beneath the enormous trunk. Was he going to die like this, all alone in the approaching night without help, without a priest, before making his ninth Communion? He called out for help a long time, but the only reply was his answering echo. He felt his life ebbing away; his suffering was atrocious. For a moment he despaired. No, God had not been able to forgive him for all his sins, they were too great. That was why He had permitted this accident before he had made his last Communion of the nine First Fridays. He was damned. The thought of it tortured him far more cruelly than his injuries. But as the moon rose slowly in the sky, calm and radiant, escorted by thousands of stars, the dying man began to hope again. Wasn't the Heart of Jesus infinitely good? Wasn't He almighty? Wasn't He the One who had sent that Capuchin Father last year and who had inspired him to ask the priest for a holy picture? Suddenly the injured man gave a start, lifted his head, looked down the road and listened . . . Yes, there it was: someone was coming! The sound of steps came closer. Gathering his fading strength, he called out with unspeakable anguish in his voice: "Help! Help! I need a priest!" Finally -----thank You, O Lord!-----a shadow materialized and made its way straight for him. The poor lumberjack thought he was dreaming when he recognized his pastor. "Oh, Father, is it really you? God is so good!" "I just gave the Last Sacraments to old monsieur Hugon." "Father, it's the Sacred Heart Who sent you!" As he spoke, the priest attempted to move the tremendous trunk and free the lumberjack's legs. "Let it be, Father. It's too heavy, you won't be able to move it. Besides, I can feel it: I'm finished. I don't have more than two hours left. Please hear my confession." The priest knelt down, heard his last accusations, gave him absolution and followed it with Extreme Unction, for he had the holy oils on his person. "Tomorrow is my last First Friday. I would be so happy if . . ."
Yes, of course. I understand. I'll be back in three quarters of an hour." "Quick, Mr. Lucas! Send your boy to church for me, and go tell the doctor that Jean-Marie the lumberjack is injured in the hills, up at the bend near Great Rocks!" Then he went to get Holy Viaticum. His altar boy arrived and they climbed quickly back up to Great Rocks. It was half past midnight when he arrived. The lumberjack was still alive and praying. When he heard the little silver bell, he raised himself painfully and made the Sign of the Cross, a big tear running down his pale cheek. He received Holy Communion, and a few minutes later he passed away gently in the peace of the Lord.